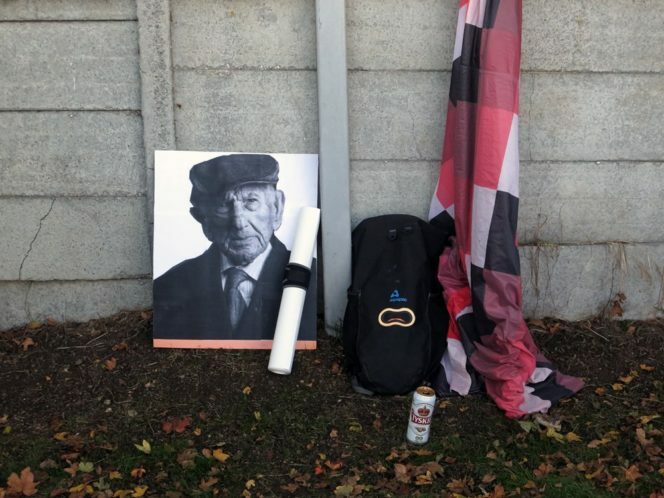 If you had just caught the scoreline, you might have been forgiven for thinking that Clapton had switched disciplines and taken up Rugby Union. 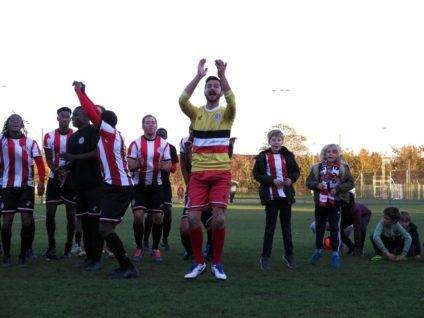 Saturday’s game with Hereford Palace provided, on average, a goal every 7 and a half minutes to entertain a brilliant crowd of 400-plus in the autumn sun. 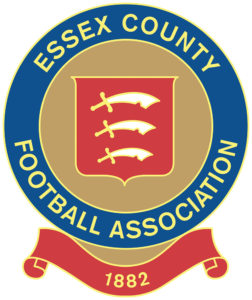 Player-manager Geoff Ocran named striker Eliot Crosbie, back from a niggling injury, as his stand-in captain for the game, with club skipper Andrew Lastic on the bench as he recovers from his own injury. Also on the subs’ bench were recent signings Tre Cartier and Jake Stevens. 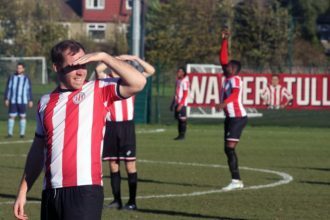 The visitors, who have been improving over the season after some humbling scorelines early in the season, were dealt a cruel blow after keeping it tight for the first 10 minutes. 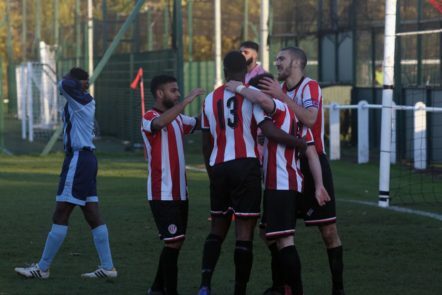 Sherwin Stanley, hot on the back of his recent hat-trick against FC Roast, was bundled over in the penalty area, having neatly turned toward goal. The penalty call was possibly borderline, but the ref didn’t hesitate in awarding the spot kick. Stanley stepped up and casually finished. So it began. Just minutes after the opener, a direct corner was won in the air by the dominant Stanley, who flicked the ball backward, falling perfectly for Eliot Crosbie. 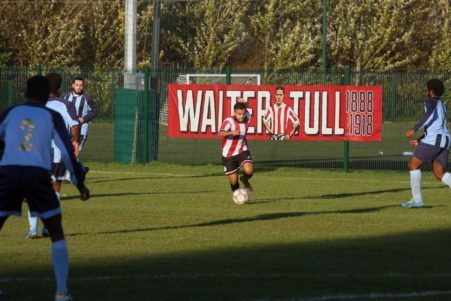 With the freedom of the penalty area, our number 10 directed a shot into the far corner on the half volley. If Hereford Palace felt hard done by from the opening penalty, they could have no complaints about the second. A reckless, lunging tackle cleaned out Eliot as he shifted the ball on to his right foot. No protests followed from the offending player, more a resigned shrug. Eliot stepped up to convert the penalty he’d won. The keeper guessed the right way this time, but couldn’t keep out Eliot’s clean strike into his left hand corner. At 3 down, though, heads were still held high and rare counter into the opposition half was rewarded with a goal. A speculative volley from a decent cross deflected off Jordon Odofin and flew past the sprawling Vlad Bendovskyy. Angered at losing a clean sheet, the ‘keeper punched his post in frustration. The Tons’ search for a clean sheet in competitive football continues. 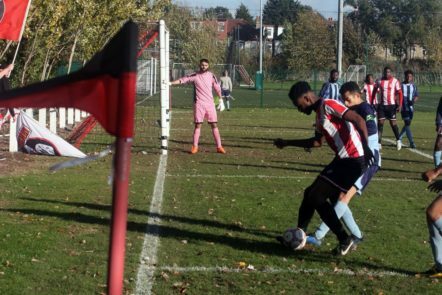 Normal service soon resumed and following a concise passing move from Clapton, the ever dangerous Josh Adejokun fired in a good cross. Stanley trapped the ball dead, turned without challenge and belted the ball past a flailing Palace goalkeeper. 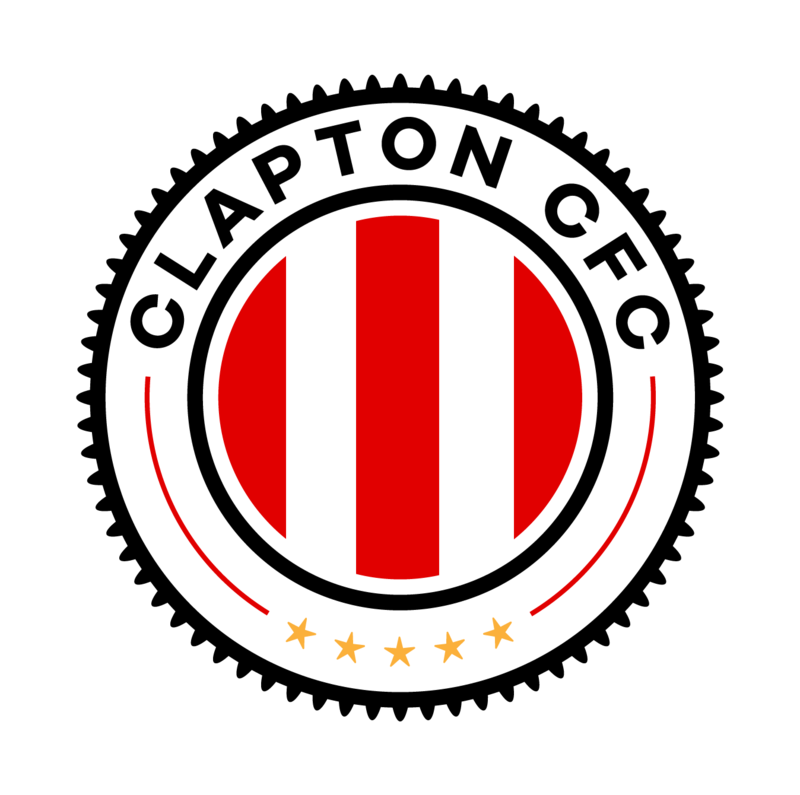 Clapton’s fifth was the result of persistent closing down of opposition midfielders. Having won the ball on the right wing, Stanley unselfishly rolled the ball back to the incoming Louis Rene, whose low shot deflected past the hapless ‘keeper. Gallery of photos by Max Reeves. If the first half was rough on the team in blue, it wasn’t getting any easier in the second half. Despite having already shipped five goals, the Palace goalkeeper could have, up to the early phases of the second half, taken comfort knowing he hadn’t been at fault. 5 goals down, but credit to Hereford Palace who were still trying to play out from the back. Odejokun’s pressing of his opposing fullback forced a throw in, which resulted in a quick chuck into Crosbie’s feet. The imposing striker, rolled his marker like he wasn’t there and thundered in a shot, this time with his left foot, into the far corner. Another stand-out performer in the Tons midfield, Nabeel Hashim, was the architect of his side’s 8th goal. 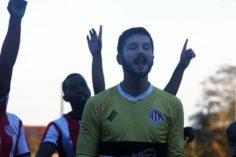 A driving run and quick pass to Eliot, resulted in a shot and decent stop from the Palace goalkeeper – a parried ball which found its way back to Hashim at the post, who then cleverly back-heeled to his newly-signed teammate, Jake Stevens, recently subbed on, netting for a debut goal. 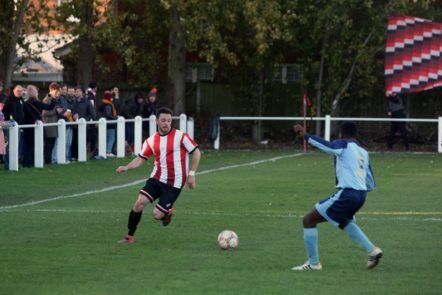 New boy, Stevens, who had been gifted his first goal on a plate, made a second goal for himself. Latching on to a good ball from deep, he won a shoulder-to-shoulder battle with the Palace defender, before cutting inside and brilliantly finishing with the outside of his boot. Despite shipping 9 goals, Hereford Palace continued to compete in good spirit and at no point let frustrations boil over into anything unpleasant. 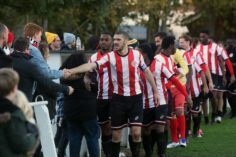 Clapton’s 10th goal seemed to be the result of the away side’s understandably demoralised defence. 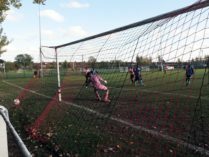 Crosbie scored his 4th of the game in the closing stages, having received the ball into feet, he found himself with no-one within two yards of him, turned, feigned and finished. 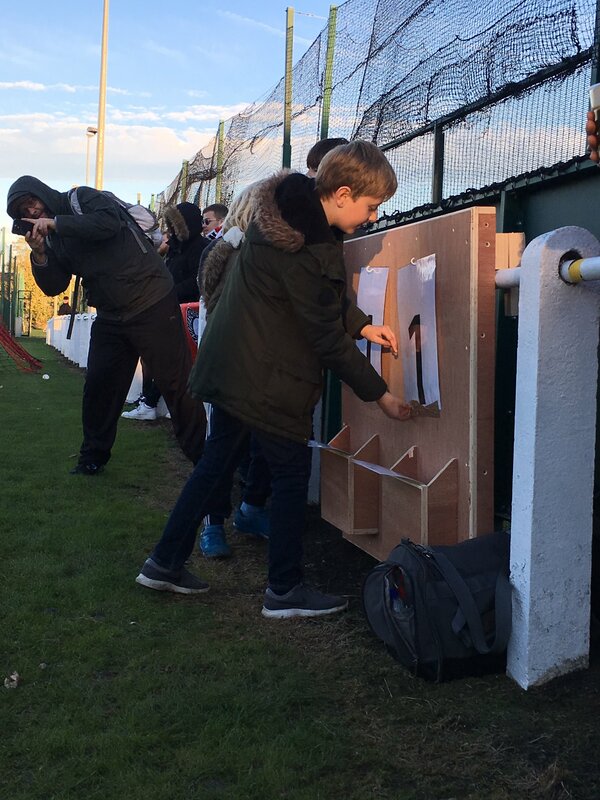 The new Stray Dog scoreboard hadn’t been designed to cope with double figures, meaning our young supporters had to improvise a “10”. The 12th goal of the afternoon might have felt cruel, if it wasn’t so well-worked. 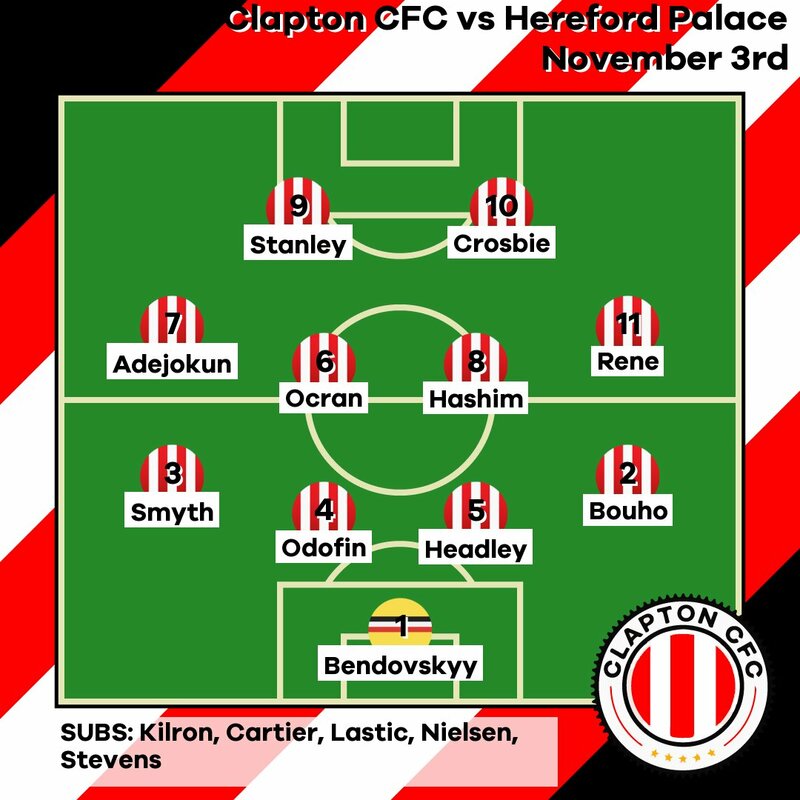 Stefan Nielsen, on as a second-half sub, played the pass of the match behind the Palace defence, finding Crosbie at the back post, who scored a remarkable 5th. 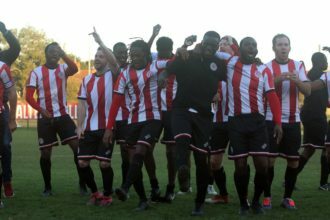 The game finished 11 – 1, the biggest league win by a Clapton side since the 1909/10 season, when they beat Shepherd’s Bush 11-0 in the Isthmian League. 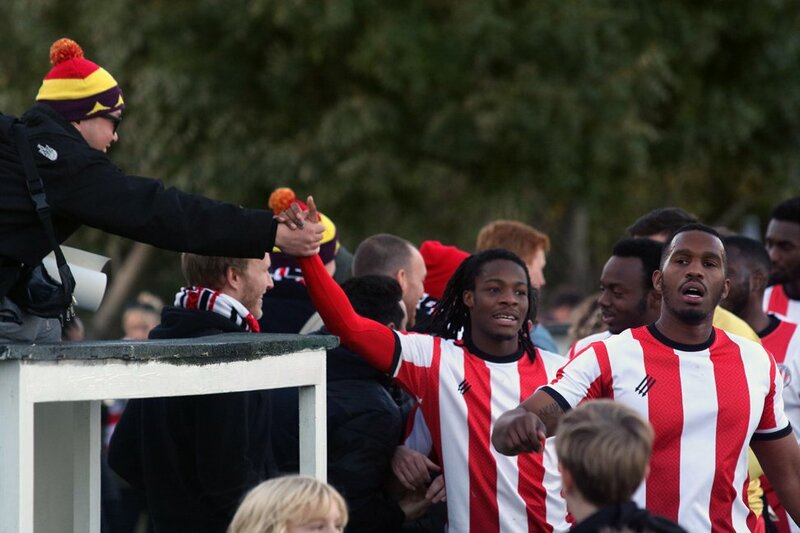 We spoke to assistant manager Stuart Purcell, stand-in captain Eliot Crosbie, and debutant Jake Stevens, after the win. A clear winner for once – with five goals, it’s no surprise to see Eliot Crosbie get the nod.